Greasemonkey and Userscripts « What's Up? Have you heard of it already? My favorite script is the Gmail + Google Reader integration. 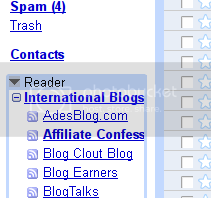 What it does is, it inserts a drop down menu for your Google reader. So it’s like opening to application in one. No need to have a separate tab for Google reader. Also the script Gmail beautifier is a must if you frequently lobby on your Gmail account. It removes the adsense ads on the right bar and drastically improved the way the buttons look like. How to install scripts to your firefox? First, download the Greasemonkey script. Once done, head over to http://userscripts.org for vast selection of scripts for different websites. BTW this post was made using my Linux Mint OS. This entry was posted by derek on February 10, 2008 at 3:55 pm, and is filled under Tips and Tricks. Follow any responses to this post through RSS 2.0. You can leave a response or trackback from your own site.